West of the 405 Freeway lies haunted territory that would make Transylvania blush: The Haunt with No Name Yet, The House at Haunted Hill, the Forest of Mirrors, and Fright Fair. Woodland Hills is so dense with Halloween horror that you can barely toss a vial of holy water without splashing the face of some passing vampire. 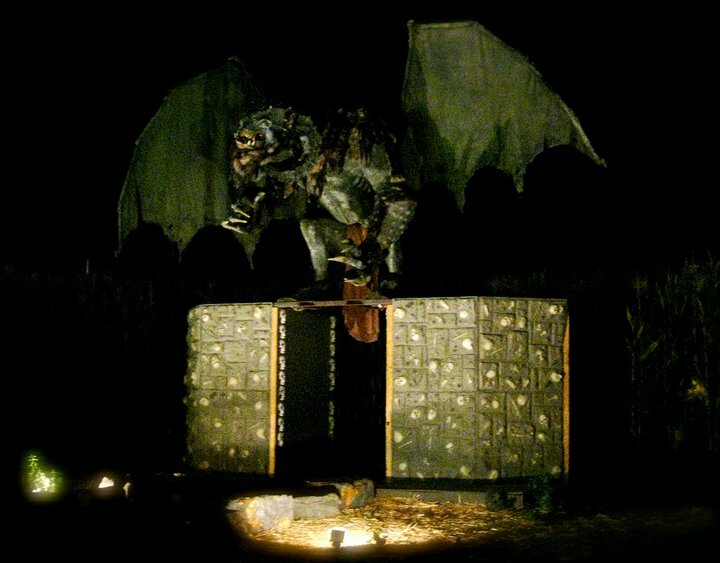 Hollywood Gothique recommends a tour of three perennial yard haunts, with an optional detour for the FrightFair ScreamPark, which has the distinction of being the longest-running independent Halloween attraction in Los Angeles. We say "optional" because, with three three walk-through mazes and loads of other activities, FrightFair probably deserves a trip all on its own, especially on a busy night. Nevertheless, its close proximity to the yard haunts earns a place on this itinerary. A. The Haunt with No Name Yet at 19351 Hatteras Street Tarzana, CA. 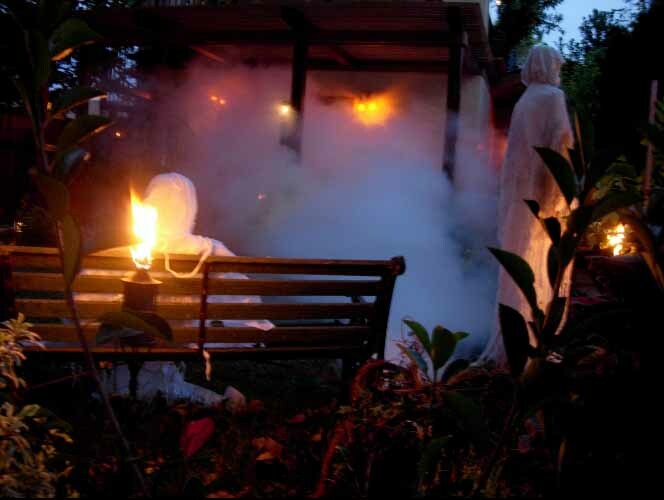 Beautifully atmospheric, this yard haunt is also low-key, relying mostly on lighting and decor, enhanced with a handful of special effects, to create a spectral ambiance perfect for the Halloween season. The Haunt with No Name will be open on October 30 and 31, and November 1 and 2. Hours are from 6pm until 10pm, except on Halloween Night, when the haunt opens at dusk. B. FrightFair Scream Park at 20800 Victory Boulevard Woodland Hills, CA. This Halloween event is virtually a mini-theme park, with hayrides and merry-go-rounds for children, and fear-filled mazes for adults. The Factory of Nightmares Haunted House has long been one of our favorites, and the Creatures of the Corn trail is almost as good - and completely different. Insane Reaction - a literal maze, peopled by monsters taunting your while you search for a way out - rounds out the frights. FrightFair is open on October 26, 27, 29, 30, 31, and November 1, 2 and 3. The kid-friendly stuff is open all day. The night-time frights begin at dusk and run till 10pm on weekdays, until midnight on Fridays and Saturdays. C. The House at Haunted Hill at 4400 Saltillo Street, Woodland Hills, CA. 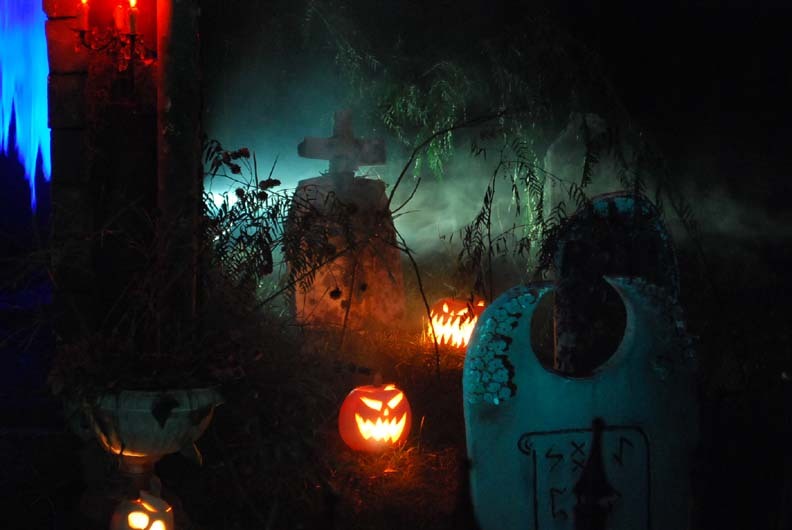 The most incredibly elaborate home haunt in Los Angeles features spectacular lighting and effects, timed to a narrative depicted through music, sound effects, narration, and projections of ghostly characters who died long ago. The show runs approximately fifteen minutes, so you really have to time your visit accordingly; you cannot just breeze through for a quick glance. The House at Haunted Hill runs on October 30, 31, and November 1, 2 and 3. Hours are 7pm to 10pm on weeknights; 7pm to midnight on Friday and Saturday. D. The Forest of Mirrors at 6124 Lederer Ave, Woodland Hills, CA. This unique back yard haunt features an amazing illusion, consisting of mirrors placed at strategic angles to suggest a garden of forking paths extending far beyond the actual boundaries of the property. Distracted by arched passageways that lead to nowhere, you will not notice the leafy monsters lurking among the dense foliage - well, you will notice them, but by then it will be too late! You don't want to miss this one! The Forest of Mirrors is open on Halloween Night only, from 6:30pm until 10pm. October 31 is the only night when all four haunts are open. However, it's probably a good idea to hit FrightFair this weekend, since it is already open, and save the three yard haunts for Halloween Night. Prioritize the Forest of Mirrors for October 31, and if you don't get to the others, you can catch up with them on November 1 and 2. The full itinerary covers nearly 11 miles, requiring approximately 27 minutes on the road. Without FrightFair, the trip takes covers 9.5 miles, requiring just over 20 minutes. You can view the shorter itinerary at Mapquest. The full tour is displayed below. Sadly, the Fallen Angel Cemetery in Woodland Hills is on hiatus for Halloween 2013. The proprietor promises to reopen the cemetery gates next year; we will update our recommended itinerary then. Note: If you have made it all the way out to Woodland Hills, why not continue to Thousand Oaks and Simi Valley? Here is what you will see. 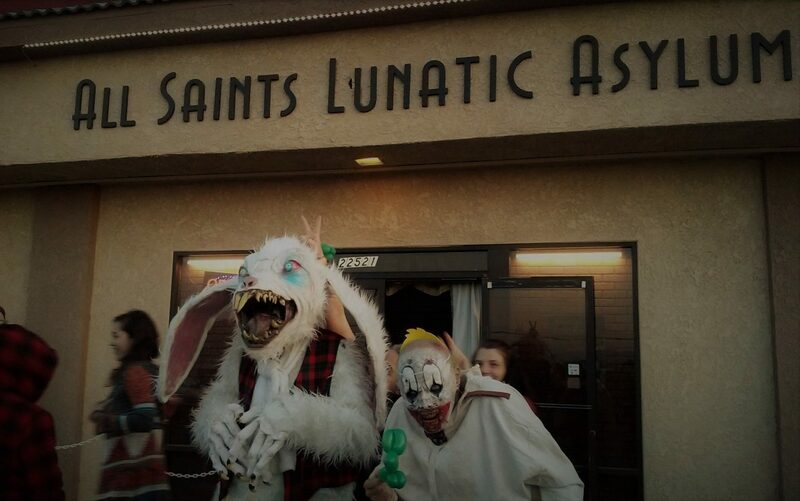 Click here to find more Halloween Haunts in Los Angeles.